This threat, dubbed as BitCrypt, is a ransomware that steals funds from various cryptocurrency wallets. This Trojan deletes itself, the copy that it drops and the added autorun registry after successfully encrypting user's files in all fixed drives. The value is used as a part of the Bitcrypt ID. It appends the string bitcrypt2 to the encrypted file's extension. 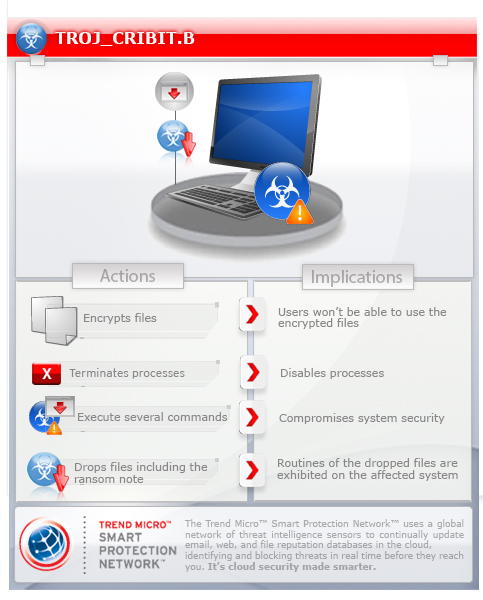 Scan your computer with your Trend Micro product to delete files detected as TROJ_CRIBIT.B. If the detected files have already been cleaned, deleted, or quarantined by your Trend Micro product, no further step is required. You may opt to simply delete the quarantined files. Please check this Knowledge Base page for more information.